Here are some shots from earlier this week. I went for a colorful combination to add a little cheer to my Monday. ah. every time I see you wear those shoes I kick myself for not snatching them...you make them look so good with every 'fit! I was born in Lawrence and just moved from Wichita to STL....miss Kansas every day!!!! That blouse is so pretty. I love the detailing on it. Great skirt and great shoes! This colour combination is fabulous, I love red and yellow together. That skirt is awesome! I have that top but in purple-really wishing I had it in yellow now! Great look. cute and fun! i love the heels. Such a colorful, fun outfit! I really really love that yellow top! And your shoes are awesome too. oh, this outfit is so cute ^^ i love your skirt and shoes! only $12? cah-razy! I love all those bright colors. The yellow blouse especially. Every Monday needs a boost in one way or another. Your fabulous shirt reminds me that I need to go check out Plato's Closet. I've never been, but there's one not too far from my house. Love that color combination! Definitely a good Monday pick me up. I just grabbed those shoes yesterday! What a bargain! ha, crazy, i totally have that FC shirt. I got it at TJ maxx for $10 and have worn it (and delicately taken care of it) for a few years. One of my favorites. Thanks for the inspiration on how to wear it. 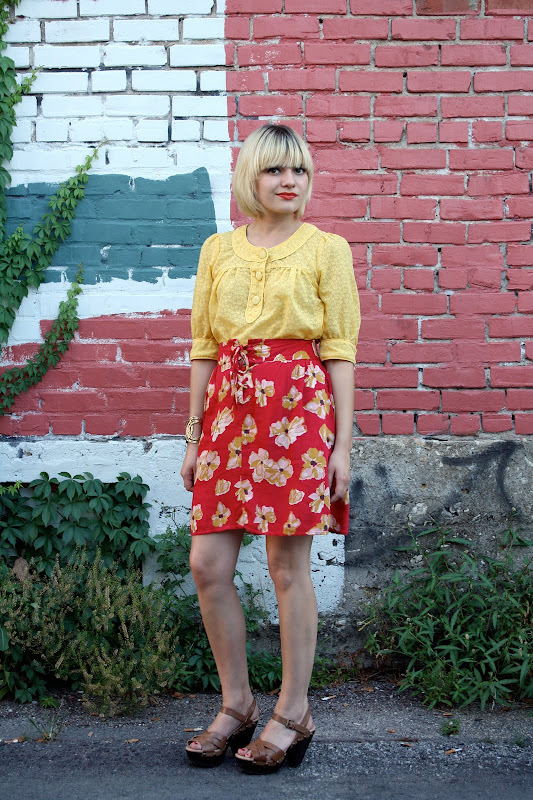 I love this red and yellow pattern mix! (And I loved it when you paired the same color combination in the school photo post!) It looks great together!